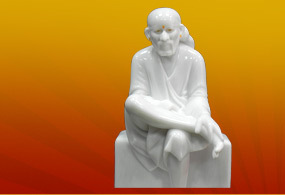 We manufacture white marble statues of Sai Baba, saint from Maharashtra. The statues are in different dimensions and postures depicting Sai baba on a throne, his signature sitting pose and him resting one handing on a pillow. The marble used has been procured from high quality limestone quarries in Rajasthan and it has been polished well, so that there are no rough and uncut edges jutting out and the statue is glazy. These statues are manufactured in different sizes and people use them to adorn the entrances of their houses, puja rooms, living rooms etc. It is easy to clean and because the marble used is of high quality, the colour of the statue doesnt change on prolonged exposure to air. 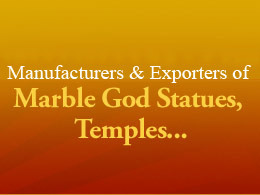 We offer the statue in different specifications according to client requests. 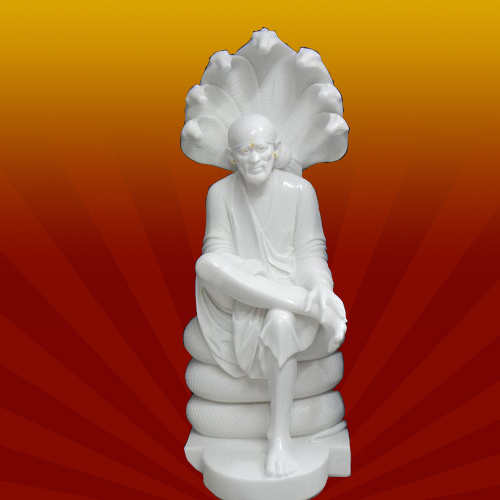 We offer statues of Sai Baba, saint from Maharashtra, loved by all. He is seen here sitting with his knee propped up and he is resting on a long pillow. The tilak on his forehead is done using yellow and red paint, just the way he wore it in real life. The statue is very life like and it has been inspired from the way he sat in real life. The statue is made using white marble procured from limestone quarries in Rajasthan and it is cut and polished well. This makes the statue glazy and it has no rough ends and edges in it. The statue is available in different sizes that would suit the space you have reserved for it. It is ideally kept in the drawing room, puja room or at the entrance of the house. 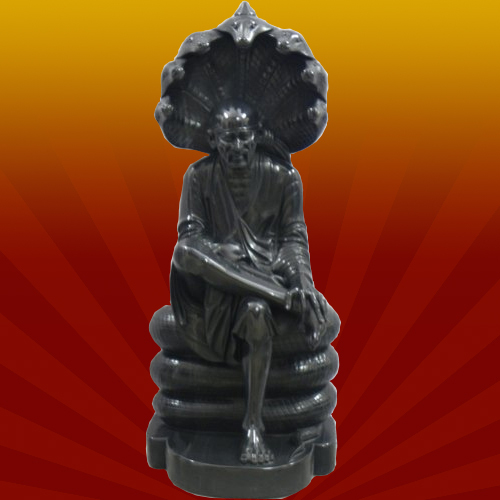 We offer Sai Babas statues in different sizes in order to suit your space. 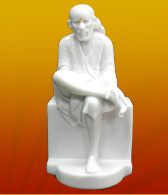 The statue shows Sai Baba in his sitting position, when he is talking to his disciples. It has been inspired from real life. The white marble used has been procured from the quarries of Rajasthan and they have been cut well and polished to add a glaze to the statue and there are no rough edges or unevenness in the statue. It does not lose its colour even on prolonged exposure to the air, because it has been made using good quality marble. They are ideally kept in the puja room, in living rooms and at the entrance of houses. They can be made in different specifications and even in coloured varieties, depending on customer requests. 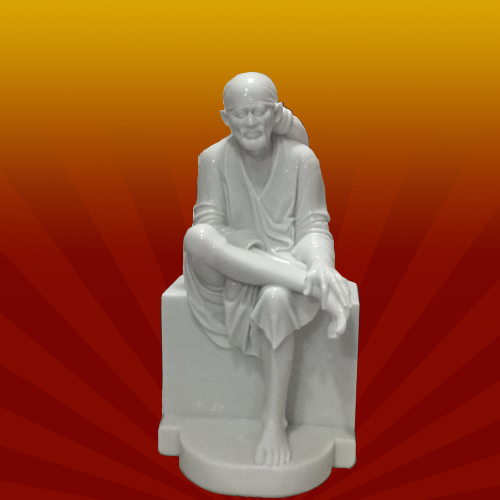 We offer different kinds of statues of Sai Baba, the saint from Maharashtra who was loved by all and was a miracle worker! 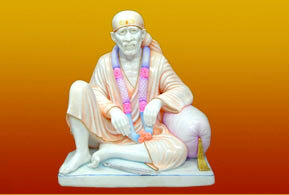 Here, we can see an idol of Sai Baba, seated on a purple coloured throne. This image has been adopted from the way Sai Baba sat in real life. The idol is made using white marble procured from quarries producing good limestone in Rajasthan. The idol has been polished and cut well, and it has no impurities in it. This adds a pristine look and glaze to the idol and people are instantly attracted to it. It is ideal for your puja place and it can also be kept at the entrance of your house. We manufacture it in different specifications according to client requests and we deliver it as fast as we can.